Passionate, proactive and determined, AUBG students are always a source of pride for the university. 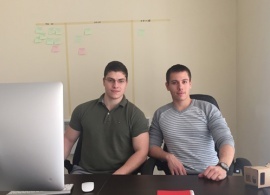 One good example comes from seniors Gavril Tonev and Hristo Georgiev who established the “AUBG Spaces” student club and in just a semester turned it into the Blagoevgrad-based software company Centroida. 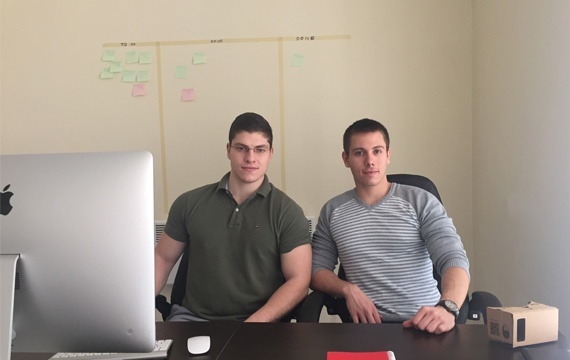 The two AUBGers started the within-campus community “AUBG Spaces” Sept. 2015 with an intention to create a friendly workspace environment that provides the link between technology and entrepreneurship on campus. “AUBG Spaces” now has more than 20 members, has conducted several successful on-campus workshops and presented its projects—including a self-maintaining solar panel and a fully developed mobile game— in local competitions. Encouraged by the club’s success, Tonev and Georgiev embarked on the journey of transforming the organization into an officially recognized company. And while managing a firm and studying at the same time is an ambitious endeavor, the two four-year students have strong academic preparation and real-life success stories to motivate them. Past summer, Georgiev, Information Systems and Business Administration major, was awarded a scholarship to participate in the prestigious Summer Entrepreneurship Program (SEP) in the U.S., an experience that further enriched his knowledge of software development and business skills. Tonev, in turn, led the team of AUBG students that won Microsoft Imagine Cup’s National Finals and reached the world semifinals in the Games category 2015. A semester after Tonev and Georgiev came up with the idea for Centroida, the company now boasts a spacious office near campus, several business orders and a team of 10 dedicated AUBG students. The team is currently working on a project for the biggest professional housekeeping company in Southwestern Bulgaria. The students are building an enterprise resource planning system that will offer a solution for managing all the data of the company. “We create the solution for them, so they would not need to use Excel tables and it will cut their costs a lot,” Tonev said. Tonev and Georgiev are eager to share their knowledge and resources with the tech-savvy students on campus. Along with external projects, the Centroida team is also planning on creating new websites for the majority of the AUBG clubs and a content management system for the Student Government at AUBG.